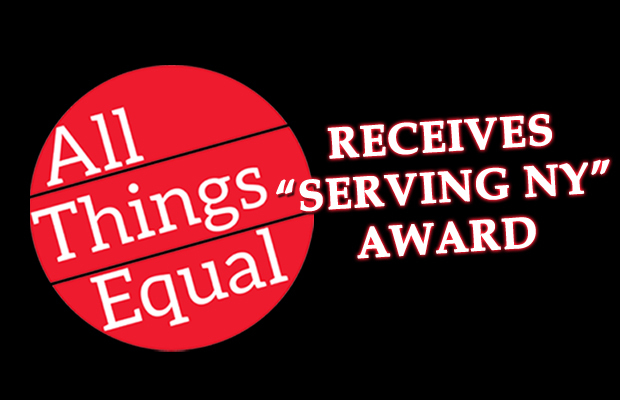 The “All Things Equal” radio show was the recipient of the prestigious “Serving New York” Award from the New York State Broadcasters Association at the Traditions at the Glen Resort and Hotel in Johnson City, on October 21st. The NYSBA award recognizes the extraordinary efforts of New York State’s broadcasters in serving their public interest every day. All Things Equal is a weekly radio show that is co-produced by Cornell University and the Cayuga Radio Group. The show features in-depth conversations on race, class, diversity, and inclusion. Cornell Associate Vice President of Community Relations Gary Stewart said about the award, “We are grateful that All Things Equal has been recognized with this honor. The show’s roots were planted in 2008, when a series of race-related incidents in Ithaca led to important community forums organized by local leaders, including Cayuga Radio Group and the Tompkins County Chamber of Commerce.” Mr. Stewart invested significant time in developing this program several years ago as a committee and Board Member of the Chamber. Previously recognized by the SUNY Council for University Advancement for outstanding interactive media, the show has been a steady resource for everyone of every background in Tompkins County. It has also provided an opportunity for measured, 15-minute conversations on sensitive issues that aren’t condensed into soundbites that can divide or dumb down, but rather nurture and forward. The show is currently being sponsored by Cornell University, The Cayuga Medical Center, Wegmans, and the Tompkins County Chamber of Commerce. Cornell University’s Office of Community Relations won the 2015 Martin Luther King, Jr. Peacemaker Award from the Greater Ithaca Activities Center and Community Dispute Resolution Center, and All Things Equal was cited as a component for that recognition.